Maximum flexibility in your everyday work thanks to StarlockMax. 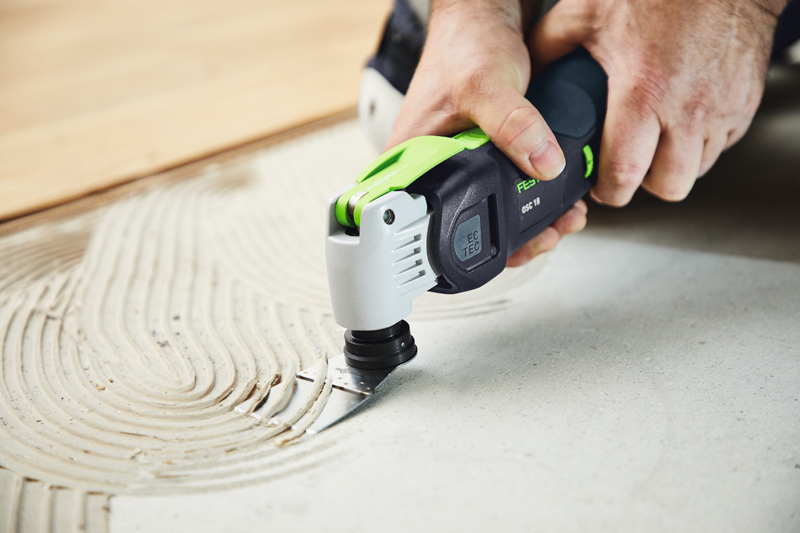 The new Vecturo OSC 18 from Festool is equipped with the innovative StarlockMax tool holder system, which enables the user to change the required saw blade easily and in just a few seconds. The patented Starlock tool-holder system covers three performance classes: Starlock, StarlockPlus and StarlockMax. As the new Vecturo cordless oscillator comes with the StarlockMax tool holder, it falls under the performance class designed for heavy-duty applications. Practical for everyday use, StarlockMax can accommodate accessories from all of the Starlock performance classes. The new Vecturo therefore shows itself to be extremely flexible to use. The versatile system accessories for the new cordless oscillator mean that this newcomer is the perfect all-rounder, and enables the user to work in a way that is healthy, comfortable and, at the same time, precise. With the new dust extraction device, users can also start sawing without generating dust – this improves safety and provides a clear view of the work area. The new positioning aid for precisely guided plunge cuts allows for accurate positioning on the marking, and simple orientation on the guide rail. The positioning aid is also equipped with a depth stop, for precisely setting the plunge depth. These system accessories can be fitted onto the adapter easily and without the need for additional equipment – depending on requirements. The Vecturo is especially suitable for heavy-duty applications. Thanks to the anti-vibration system, the housing and motor are completely decoupled. This reduction in vibrations and running noises leads to optimum comfort while working. The powerful, brushless EC-TEC motor with variable speed control allows for a large oscillation angle of 2° to the left and 2° to the right, and therefore achieves optimum working progress. In combination with the powerful and durable 18 V Li-ion compact battery pack, the cordless oscillator achieves maximum freedom of movement without any cables – even for heavy-duty applications. The new Vecturo OSC 18 cordless oscillator will be available at specialist retailers from April 2019. Festool also offers full investment security for their new Vecturo OSC 18 thanks to Festool Service. The free-of-charge service package guarantees direct, practical and comprehensive service for the tool throughout its entire service life.